INDIANAPOLIS -- Environmental groups are pushing the Indiana state legislature to devote more money to fixing and maintaining Indiana’s state parks. 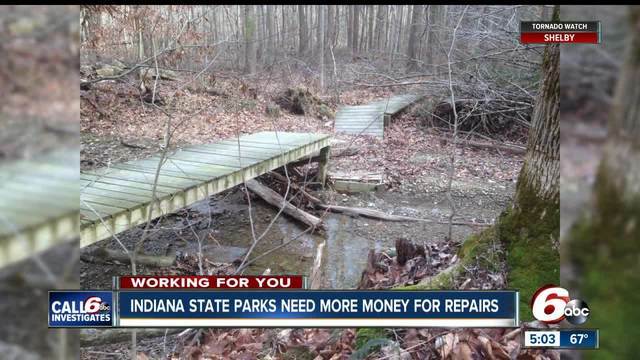 Tim Maloney, Senior Policy Director for the Hoosier Environmental Council, expressed concern Thursday that the money dedicated to repairs has been dropping over the last ten years and it’s starting to take its toll on Indiana’s parks. Maloney pointed to photos from Brown County State Park that show cracks in picnic shelters, crumbling stone walls and dilapidated boardwalks. Indiana Department of Natural Resources has more than 3,000 structures at its state forests, state parks, trails, natural preserves and outdoor recreational facilities, records show. The DNR needs about $60 million to fix trails, shelters, and other infrastructure, Maloney said, but the budget bill passed by the House calls for $38.3 million over two years, or about $19 million a year. Call 6 Investigates requested a list of needed from the Indiana Department of Natural Resources. However, the agency denied our request. Joe Hoage, general counsel for DNR, called the list a “deliberative document” and also denied claims from environmentalists who requested a specific list of things that need to be fixed.